Dora Young's book was published in 1974 and is currently out of print. It contains twenty-one original tatting designs by Dora Young using her patented technique of knotless tatting. The patterns have a variety of uses as doilies, edgings, pot holders and many motifs to use in any number of applications. Dora Young was born in Portland, Maine. She learned to tat while in high school. Some years later in 1955 during a period of poor health she picked it up once more and set a 20 year goal to provide new tatting patterns for tatters. Dora was an extrodinary tatter. She was the only tatter to ever receive a U.S. patent for a tatting technique. She called it the "knotless method chain." Her patent was approved in 1973. 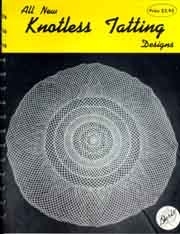 In 1974 she published her patented technique along with 21 original designs in a book called "All New Knotless Tatting Designs." Today her technique is referred to as the split chain or bridging. She also wrote an article on tatting and it's history in a book published by The House of White Birches, Inc. In 1982. This article also showed a few of her shuttles and tatting patterns.